The Alanis collection brings a new class of uncomplicated elegance. 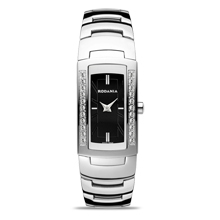 Its anatomically rectangular case blends in well with the stainless steel bracelet to create an ode to feminity. Many variations of this stunning watch are available, with Swarovski® stones surrounding the dial, in IP black or in two-tone silver and IP gold. 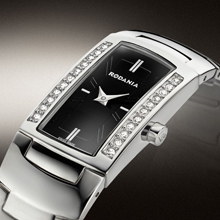 Every woman in search of feminine refinement will find her matching timepiece in this thrilling collection.